I mean no disrespect to the revered American Indian warrior. 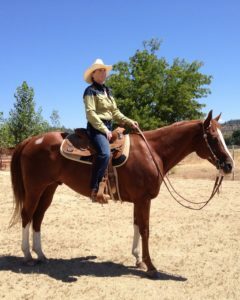 But my sweet sorrel Paint horse, Brad, should be re-christened Crazy Horse. That ‘s because my boy, after two years of behaving (mostly) calmly in hand or under saddle, inexplicably has taken to obsessive observation of birds, bushes and other scary stuff like garden tractors that MIGHT MOVE UNEXPECTEDLY or MAKE A SURPRISING AND POTENTIALLY DEADLY NOISE! Just yesterday after I led him from his pen and saddled up, Brad seemed good with life and with me. The outdoor temp was in the 90s with a gentle breeze blowing. Our barn manager, Terry Stringfield, trundled to and fro on his tractor, fluffing the arena footing and then mowing the field grass back of the barn. Normal and calm, right? I led the saddled Brad to the outdoor arena. Again, he seemed copacetic with everything. I looked forward to a good if short ride, as it was growing late and I planned to work in a visit before dinner to a friend temporarily ensconced in a rehabilitation facility. Mounting Brad in the arena, I settled into my rough-out work saddle and adjusted the bridle reins. He felt at ease, though with a slightly elevated head. That should have been a clue. We eased into a walk, me riding with legs softly engaged and both hands holding the reins low, in light contact with the bit, on either side of the saddle horn. We’d round the ring each way and then do our training circles, diagonal passes and straight lines at the three gaits, as usual. Or not. At the far corner Brad jumped as the wind rustled an oak branch. His ears and neck went up and stiff. I made him trot small circles at the point of spook, in each direction. That would alter his behavior and bring his attention back to me. Then the tractor mower clanked over some sticks — ka-blang! He jigged, and tossed his head. More circling. More leveling out. Ahh. Now we’re good to go. A few moments later, jogging down the rail, Brad again acted antsy. He again began looking for every potential threat beyond the arena. So, even more circling, leveling, driving calmly forward. We passed previous “shy-spots” until we could pass without incident. I grew sweaty. Brad grew sweaty. I hoped my friend wouldn’t mind industrial-strength horsey smells at her convalescent center! The Grand Shy — which should be a recognized dressage maneuver — happened OUT OF THE BLUE when we’d been “riding” a half hour. We were trotting nicely along the rail when Brad’s haunches suddenly spun left, his front end lifted, and he ran BACKWARD for thirty feet. Heart in mouth, I teetered on the edge of an unplanned dismount. After regaining control, it was back to work, sweating with the oldies — myself, and Brad — though at age 10 he’s really only middle-aged in horse terms. It took another half hour. But we finally executed a reasonably slow and relaxed walk, jog and lope on a loose rein, with forward motion, all the way around the ring, and through the middle. We’d win no prizes. It wasn’t pretty. But we got ‘er done. I marvel at how my writing is like this, some days. I sit down all fresh and ready to write forward, mingle with my characters, enjoy the scenery and engage in the action. I am in control, mistress of my literary universe. This work, overall, will be fun. I settle in. Then some element revolts. A character veers off course, an action scene stops mid-struggle, or a conversation jumps the tracks. That’s when I must take a deep seat, steady my hands, and — YES! — breathe, relax. Work through it. No matter how long it takes. Sometimes you just have to be happy with what little you get, even if it’s barely passable. Sometimes you let it go. After all, tomorrow is another day. Alternately? Go saddle a different horse! Yesterday I drove the white Honda six miles south of Grants Pass to scope out a ranch where I might move Brad, my handsome sorrel equine partner and plot-development guru. I’ve visited Nelson Cutting Horses and Saddle Mountain Cattle Company before. I felt drawn to its state-of-the-art stable, sweeping fields and covered arena. Perfect for keeping a horse clean and slick, and a rider sheltered, during the punishing days of our cold, wet winters and sizzling summers. Plus there was the prospect of riding a grand 300 acres of irrigated pasture and exploring the tree-lined banks of the Applegate River — a fish-rich tributary of the mighty Rogue. Big skies, picturesque green hills, lush pastures for black Angus cow-calf pairs that roam at will. All this and a clean, well lighted stable, too. What wasn’t to love? My only sticking points were, as before, the depth of the arena footing (deep, for cutting horses), a community tack-room where one’s saddle, etc. could be “borrowed” at any time by a guest or another boarder, and that there might not be like-minded souls to ride with. Don’t get me wrong. I have loved keeping The Bradster (Shiny Good Bar) — the semi-retired Western show horse seen on my “Saddle Tramps” book cover – the past two years at Cedar Tree Stables near town. It’s beautiful, too, and features perfect footing in the outdoor (only) arena and grassy arena-trail course. The stable is clean and safe with outdoor pens for every horse. But most times I ride alone, as other owners have other priorities. And I ride outdoors only, even in extreme weather. If the other horses are turned out, Brad has to stay out with no shelter: He freaks at being the only horse in the barn! All this circled around my mind again as I drove the packed-gravel drive along the river toward Saddle Mountain’s stable and arena. The pastures spread away to a forested ridge to my right. The giant, rolling Rainbird sprinklers were arrayed sparingly. Black cattle dotted the grassland. A red-tailed hawk picked at his ground-squirrel breakfast on a boulder by a watering hole. An “aaahhh” feeling filled my heart and made me smile. Would this be our new home? Would this be enough to seal my decision to relocate Brad? However, despite the ranch’s beauty, I still had reservations, as noted. Would I, would he, be happy here? Then I saw the dozens of pickups and horse trailers parked outside the arena. Riders coming and gong. There was a monthly barrel race set to begin! I parked, walked into the stable and met a darling younger woman, Katie, who boarded there. “I love it,” she beamed, saying she rides her older Paint horse often in the fields and beside the river. I learned the tack-room situation might be improved, and that Brad could be legged-up (conditioned) to stay sound in the arena footing. Climbing into the small covered grandstand that overlooks the arena, I was surprised to see and chat with a longtime, horsey artisan-friend, Spirit, who’d brought her daughter to the races. The excitement and camaraderie there were electric. 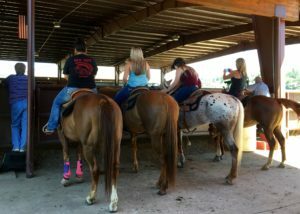 Here were my people — all ages, active, outdoorsy, fit and dedicated to The Sport of the Horse! That did it. Hey, Nelson Cutting Horses & Saddle Mountain Cattle Company? Brad and I are so THERE. Or we will be in a few weeks. I can hardly wait. Change and experiment are good. They open minds, spur growth. But nothing compares with the feeling of being where you belong, being among your own — be they riders, readers or writers. How can odd collectibles inspire? How can freaky yet treasured objects have the power to, well, power us forward? Surely you own some strange little something that’s followed you from place to place, that’s evoked a succession of smiles or head-shakes. You have no idea why you still have it. Why you snatched it from someone, once. Why you haven’t just pitched it out. Yet you know you will keep it forever, and in a place of honor, no less! It’s that way with my duck-feet goblet. Obviously crafted in the freewheeling 1970s by some slightly deranged artisan, it’s just wrong. An art object that raises objections. Funny, yet not. I think much of the appeal relates to the memories it stirs. Back in my own freewheeling 1970s I kept my horses at Jeanne and Chuck Wolfe’s Bridlewood Stables near Seattle. I wrote fast and furiously for The Seattle Times, enjoying some notoriety, mostly good. We horse-pals gathered at the owners’ home every Christmas for a Barn Party that featured fabulous food and a fast-paced White Elephant gift exchange. We brought wrapped presents — weird or recycled stuff being highly prized — and rolled dice to make our selection. We could choose an unwrapped gift, or take somebody else’s unwrapped one. And take it again until time ran out. That duck-feet goblet first claimed by Boots Leonard was the coolest thing I had ever laid my peepers on! Purposeful, hand-crafted, funny. Never mind the “ick” factor. I had to have it. We went around the circle rolling dice, taking gifts, for an hour. We were twenty people. I took the goblet, but Boots kept taking it back. When the clock stopped she had it. I was crestfallen. Then she rose, walked over and handed it to me. I felt grateful and humbled. Yes, I still smile and shake my head at the goblet, forty years later. Yes, it is an emblem of its time, of the friends, the aesthetic and the hopeful energy of days that still dance and glow in memory. But it is also more. It represents myself — a slightly odd but capable artist going her own way, IN her own way, eliciting her own smiles and followers. 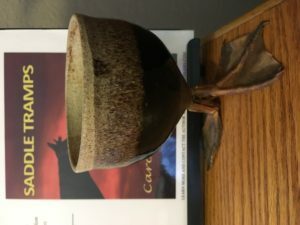 Bonus: The duck-feet goblet, like the artist, stands in its own truth, holds a universe of ideas, is a testament to friendship, and owns its uglier aspects while working for a higher purpose. Well, that’s my story, and I’m sticking to it!